With the United States' declaration of war against Japan, Germany, and Italy, every American was expected to do their part to contribute to the war effort. 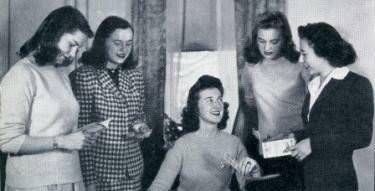 Young women at Chevy Chase Junior College were no exception. In 1942, a new policy instituted by President Carrie Sutherlin and Dean Harriet Howey allowed students to take time away from their studies to volunteer their services in the national emergency. The war was not taken lightly by any girl attending Chevy Chase, for almost all had a relative or friend serving in the military. They understood what a privilege it was to attend college during war time, and it was emphasized throughout the school that each girl should contribute some time or money to the cause. "If at times we may feel somewhat restricted, let us stop and 'take another look at what we call our troubles.' Let us meet in an increasing measure the spirit which carries our brave boys in their service to our country." 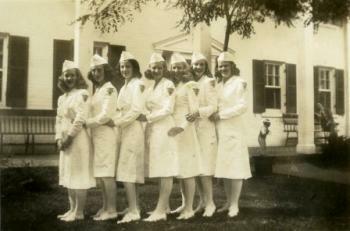 In 1944, the Senior class of Chevy Chase Junior College was very involved in the war effort. One of their main projects was to sell war stamps twice a week in the front hall of the school. Offering the stamps in all denominations, the girls would fill up as many stamp books as possible in order to exchange them for war bonds. "Bonds! 'Any Bonds today?' -- this line delivered in a teasing yet serious tone, has convinced many a girl to air out her patriotism and really dig down deep."